I hope you appreciate that i died for this article! Twice. Correct, a bunch of painted polygons (luckily they are forged together to a very beautiful world). But you can see (or can’t see) another detail: No hard edges between the trees and the ground. Since computers are able to render a lot of grass, flowers and bushes we can hide sharp polygon edges very well. At least, if you don’t look from above. In WoW this isn’t a problem since you don’t look very often like this at the game. But there other games out there – and some of them use exactly such a top-down-perspective! So how do they handle this problem (expect from just accepting it)? 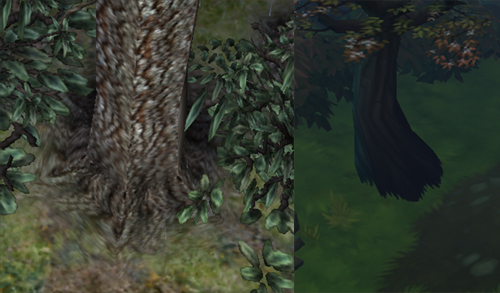 On the left you see a tree out of Dungeon Siege and it’s more or less just a 6-sided cylinder with a wood texture (at this time this was more than enough! I loved the graphic back in 2002)! The interesting part is, that they widened the cylinder at the bottom and faded it out smoothly. So they avoided a hard 6-sided-tree-ground-cut and blended nicely into mother earth. …you’ll see that it’s not grass which covers the tree. The stump itself has some alpha1-cutouts and let you see though! In my eyes, this is a very nice trick! I mean really…they render less to show more. This is almost philosophic! This entry was posted in Game Art Tricks and tagged Dungeon Siege, Torchlight II, World of Warcraft on 27. September 2013 by Simon.